Speaking in General + the Usage of the Word, "the"
The following are some comments I wrote several months ago when I was assessing a Task 1 Writing test answer. I thought that I had already written this material on this website but I see that I had only touched on these two grammatical points at several places in the question notes I have written, without going into much detail. In the notes below, I still do not cover the topic as thoroughly as a good grammar textbook. Furthermore, the comments below do not include all the comments I made for this essay, just my comments on the grammar. You will notice that there is some linkage between the two grammatical topics,"speaking in general" and the usage (or non-usage) of the word, "the". Overall, it is clearly seen that there are 7 stages in the whole brick manufacturing process, beginning with clay excavation. The process only finishes when bricks are delivered to meet the customers’ demand. Firstly, people dig up clay by using a big digger. To get rid of the oversized pieces of clay, they put the clay on a metal grid and let small pieces drop on a large roller. At the next stage, sand and water are added to clay. After bricks are shaped by using a wire cutter or a mould, they are moved to a drying oven for 24 to 48 hours. Those bricks are heated in a special kiln at a moderate temperature (200c - 980c) at the fourth step. Afterwards, they continue to be heated for the second time at a higher temperature (870c - 1300c) in another kiln. Before being packaged at the sixth stage, bricks are treated in a cooling chamber for 48 to 72 hours. The entire brick producing process concludes after bricks are delivered to customers. Your mistake concerning the article, “the” (i.e., your omission of it) was significant enough to limit your grammar sub-score to 7, even though there were no other grammar errors to speak of. The fact that you repeated the error several times makes this error “worse” only a little bit – the repetition really shows that this is a “systematic error”, which means that it is your habit or based on your (mis)understanding of English grammar. The repetition reinforces the fact that it was not what I call, “a simple error”. Simple errors are often based on old habits from when you started learning English. The writer usually knows they are wrong if he or she has time to re-read the essay and correct such simple errors. Even native English speakers make simple errors, usually because they change their original sentence but forget to change everything about it. IELTS examiners usually grade a single case of a “simple error” very leniently, especially if the candidate clearly shows that he or she is strong in grammar. I have highlighted below the cases of this error in your essay. The examples labeled 1, 2, 3 & 4 are simply repetitions of the same error. Overall, it is clearly seen that there are 7 stages in the whole brick manufacturing process, beginning with clay excavation. The process only finishes when bricks (1) are delivered to meet the customers’ demand. Firstly, people dig up clay by using a big digger. To get rid of the oversized pieces of clay, they put the clay on a metal grid and let small pieces drop on a large roller. At the next stage, sand and water are added to clay. After bricks (2) are shaped by using a wire cutter or a mould, they are moved to a drying oven for 24 to 48 hours. Those bricks are heated in a special kiln at a moderate temperature (200c - 980c) at the fourth step. Afterwards, they continue to be heated for the second time at a higher temperature (870c - 1300c) in another kiln. Before being packaged at the sixth stage, bricks (3) are treated in a cooling chamber for 48 to 72 hours. The entire brick producing process concludes after bricks (4) are delivered to customers. To understand your error, you first need to know more about the topic of Speaking in General. In English, we usually use the plural of nouns (i.e., countable nouns) when speaking in general. This is not a 100% strict custom or “rule” and there are several variations or exceptions to this custom but this is the usual case. For example: “People are not comfortable living in a climate that is either extremely hot or extremely cold.” It is possible to also say or write, “A person is not comfortable living in a climate that is either extremely hot or extremely cold” but most English speakers choose to use the plural form. A further example: “Dogs are four-legged creatures that say, ‘Bow Wow’ ”. For all of these cases of people, boys, girls and dogs, the meaning is “all people” (boys, etc), almost all of them or the typical examples of them, or a truism. Quite often, when a scientist or other expert is speaking, they use the singular form to define what that noun is. For example, “A triangle is a plane (2D) figure consisting of three straight sides.” Or, “A dog is a four-legged creatures that says, ‘Bow Wow’ ”. In fact, scientists and other experts often use “the + singular noun” when defining something in the living world. For example, “Scientists believe the domestic dog is related to the wolf”. Now, you began the essay by correctly writing, “ … how bricks are manufactured for the building industry”. But when you write “bricks” instead of “the bricks” in errors 1 to 4, I sense that it is wrong because it is too general, i.e., not specific enough. This seems strange, since “bricks” was OK in the first sentence. The explanation is this: If you were not describing a flowchart but instead were writing a more general description on how clay bricks are made, then I think the best choice would be to use the plural, “bricks” or even better, “clay bricks”, but once you have brought the flowchart to the reader’s attention in the second sentence, you should use “the bricks”. Why? The reason is this – in the flowchart, we are looking at the progress through the system of those bricks that are shown in the diagrams. Even if there were no pictures of bricks, you should still use “the bricks” if describing a flowchart because the reader is imagining a particular batch of bricks progressing through the system. 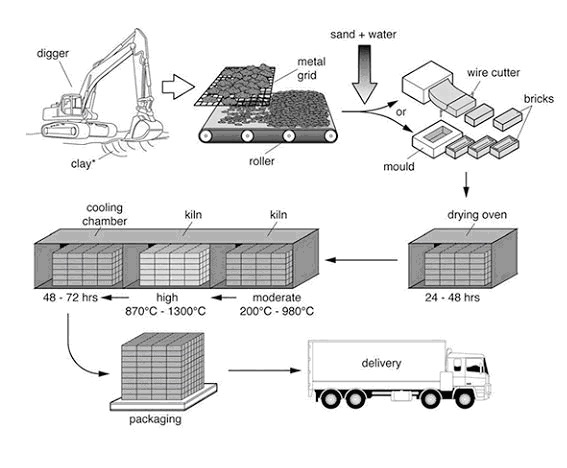 The sense that errors 1 to 4 are wrong is heightened by the fact that there are many cases in which “bricks” are not made the way the flowchart shows, and cases when bricks are not packaged before being loaded into a truck. For example, many people in the world still make simple bricks by compressing dirt and cow dung into blocks, which are then baked under the sun. And some bricks are made of concrete. Your use of “people” in, “Firstly, people dig up clay by using a big digger” means, “All or most people dig up clay by using a big digger”. Well, I haven’t! It would be best to use the passive voice here: “Firstly, clay is dug up by using a big digger”. The statement, “sand and water are added to clay” should specify which clay, not just clay in general. The clay that was dug up is what we are following here in the flowchart. Use, “the clay”. Notice that “clay” is a non-count noun so there is no plural form. Using “those” in “Those bricks are heated in a special kiln at a moderate temperature” seems unnecessary but is certainly not wrong. Some native English speakers might speak or write like that but I would prefer simply, “The bricks”. The following grammar point is related to what I wrote above. That rule also applies to compound nouns such as “swimming pool” or adjective + noun combinations such as “old house”. For example, in English we normally can’t make such sentences as, “That’s book.” It has to be “That’s my book”, “That’s a book” etc. The word “the” belongs to the same group as “this” and “that”. Not all languages have an equivalent word to “the”. It is used, a) when there is only one, e.g., “The moon is bright tonight”. Or it is used, b) when the listener or reader knows, or is being told, which one. For example: “This is the book I bought today”.